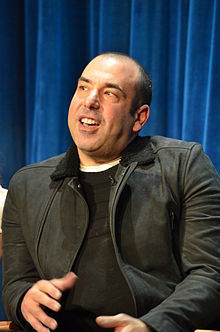 ریک هافمن (اینگیلیسجه: Rick Hoffman) آمریکالی اوْیونچو. ۱۲ ژوئن ۱۹۷۰ ‏ ایلینده نیویورک ایالتینده دۆنیایا گؤز آچیب. 1997–گۆنوموز ایللر آراسیندا سینما ساحه‌سینده چالیشیب. 2002 Crossing Jordan Phil Berman episode: "As If by Fate"
Monk Agent Kohlms Episode: "Monk Meets the Godfather"
American Dad! Caroler #1 / John Hinkley (voice) Episode: "The Best Christmas Story Never Told"
2007 Chuck Agent Scary Episode: "Chuck Versus the Sandworm"
CSI: Crime Scene Investigation Michael Raykirk Episode: "Cockroaches"
Shark Sam Harris Episode: "Here Comes the Judge"
2008 Law & Order: Special Victims Unit Gary Lesley Episode: "Closet"
Las Vegas Scott Noel Episode: "2 on 2"
NCIS Kelvin Ridgeway Episode: "In the Zone"
Leverage Alan Hoss Episode: "The Two-Horse Job"
Lie to Me Peters Episode: "The Best Policy"
2010 Better Off Ted Veridian Foundation Head Episode: "Mess of a Salesman"
Human Target Shelly Episode: "Ilsa Pucci"
The Mentalist Christopher Lynch Episode: "Red Letter"
Numb3rs Award Show Producer Episode: "And the Winner is..."
2016 Ballers NFL PA Rep Episode: "Most Guys"
اینگیلیسجه ویکی‌پدیاسی‌نین ایشلدنلری طرفیندن یارانمیش«Rick Hoffman»، مقاله‌سیندن گؤتورولوبدور. ( ۲۲ ژانویه ۲۰۱۸ تاریخینده یوْخلانیلیبدیر). قارداش پروژه‌لرده ریک هافمن گؤره داها آرتیق بیلگی‌لر تاپابیلرسینیز.